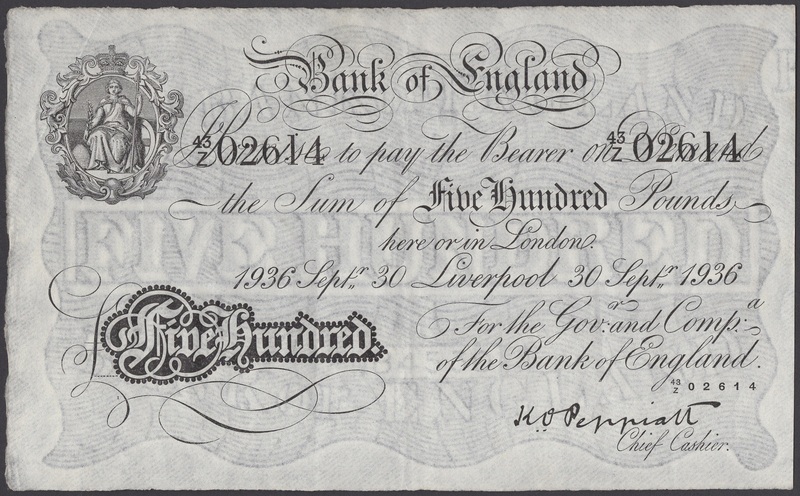 A rare £500 Bank of England note issued in Liverpool in 1936 recently sold for £12,000 in an auction of British and Irish Banknotes at Dix Noonan Webb, in London. The fine example was estimated to fetch £8,000-12,000 and is one of only ten to fifteen examples known to be in private hands. Other highlights of the sale included a very fine example and exceptionally rare wartime £1 note from the States of Guernsey, £1, dating from 15 October 1918, which sold for £9,600 against an estimate of £4,600-£5,500, and an extremely rare Bank of England, £5 dating from 13 August 1833, which sold for £11,400 (Est: £7,000-9,000). A Bank of England, £5 from Newcastle on Tyne, dated 16 July 1889, one of only two examples known in private hands, sold for £10,200.